The Cabinet Office has today announced that they will be taking a long-term lease at Make’s third building designed for the Arena Central development in Birmingham. The 239,000ft2 office building was granted planning consent in December 2016 and was shortlisted as a potential new home for a number of government departments as part of the government’s drive to modernise and improve the efficiency of its estate. 3 Arena Central is located at the heart of Make’s masterplan for the development, which is being delivered by Arena Central Developments Ltd (ACDL), a joint venture led by Miller Developments. The building is situated behind the listed former Midland Bank at 301 Broad Street and is fronting a new public square. At 14 storeys, 3 Arena Central’s geometric, punched metal cladding will be visible from Centenary Square and Mecanoo’s Library of Birmingham while forming a focal point within the masterplan. Architect Joanna Pilsniak said: “From the outset, the Arena Central masterplan was all about fulfilling the civic potential of this site – opposite Centenary Square with its stunning new library and the Birmingham Repertory Theatre and International Convention Centre – as well as delivering the very best in commercial office space to provide for the future of the city. 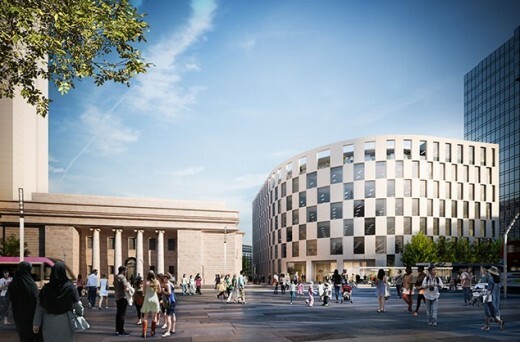 So, with HSBC due to move in next year to 1 Centenary Square and planning consent granted for 1 Arena Central it’s fantastic that this building will soon come to fruition too, especially as it will help bound the new Bank Court public realm. 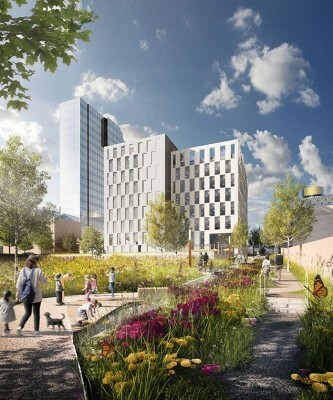 The development of 3 Arena Central will trigger the development of much of Arena Central’s public realm and landscaping. The building will open on to Bank Court – a new formal square which will be the centrepiece of the site, bounded by 1 Arena Central, 301 Broad Street, 1 Centenary Square and 3 Arena Central. A double height colonnade along three sides of the building provides a direct link between Bank Court and a second more informal landscaped space, called The Terrace, which will step down the slope of the site towards The Mailbox and link to the Serpentine Path winding through the whole length of the site. Along the northern face the colonnade will reinforce a pedestrian route from Richard Seifert’s listed Alpha Tower through to the canal. 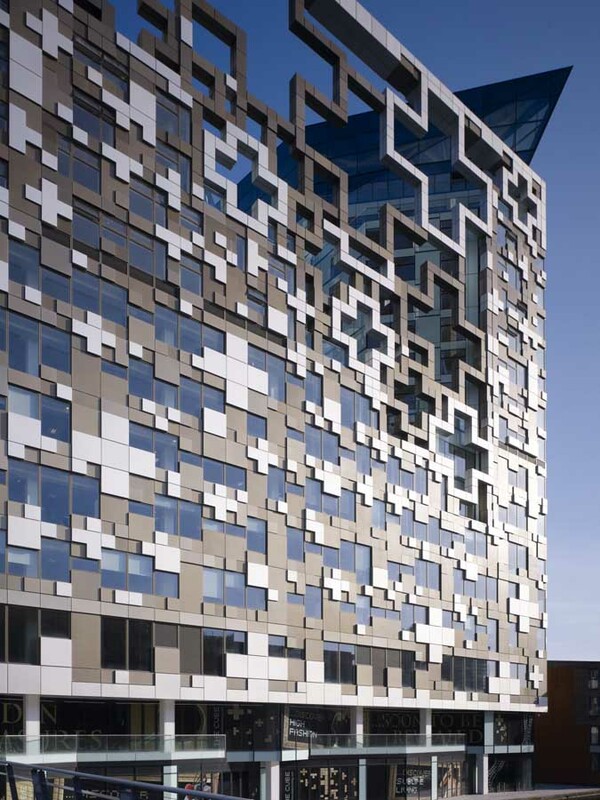 Arena Central is a £500 million scheme on a 9.2-acre site in the heart of Birmingham. Make has masterplanned the full site and designed three major buildings so far, including its gateway structure 1 Arena Central, a mixed use development on Centenary Square with office, retail and restaurant space, and 1 Centenary Square (formerly 2 Arena Central), Birmingham’s first building with LEED Gold accreditation, which, in 2018, is due to become the headquarters of HSBC’s new ringfenced retail banking division. Birmingham City Council has granted detailed planning consent for the development of the first commercial building at Arena Central. Fronting Broad Street and sitting opposite Centenary Square, 1 Arena Central – which is set to be the first speculatively developed new office building in Birmingham City Centre since the start of the latest property cycle – will provide 140,000 sq ft of accommodation across eight floors including 135,000 sq ft of Grade A office space, with typical floorplates of 21,000 sq ft. The building will also offer 5,000 sq ft of retail units on the ground floor and 68 car parking spaces in a secure basement environment. 1 Arena Central is the first step in the masterplan for the 9.2 acre mixed-use site, which is being delivered by Arena Central Developments Ltd (ACDL). Outline planning permission is already in place for 2.3 million sq ft of mixed-use space, including 860,000sq ft of Grade A office accommodation, over 200,000 sq ft of residential units, 2,500 car parking spaces and more than 1.2 million sq ft of retail and leisure units. Jonathan Wallis, ACDL, said: “With reserved matters planning consent now secured, we are poised to begin the first phase of development at Arena Central in earnest and 1 Arena Central could be available to occupiers in mid 2016, ahead of the competition. Our location provides an outstanding advantage to occupiers in terms of the availability of amenities and access to transport links, with a stop on the new Midland Metro tram due to be delivered adjacent to the building’s main entrance. Designed by Make, 1 Arena Central features a curved façade with a contemporary chequerboard motif, designed to encourage pedestrian traffic onto the site and forming an extension to Broad Street. 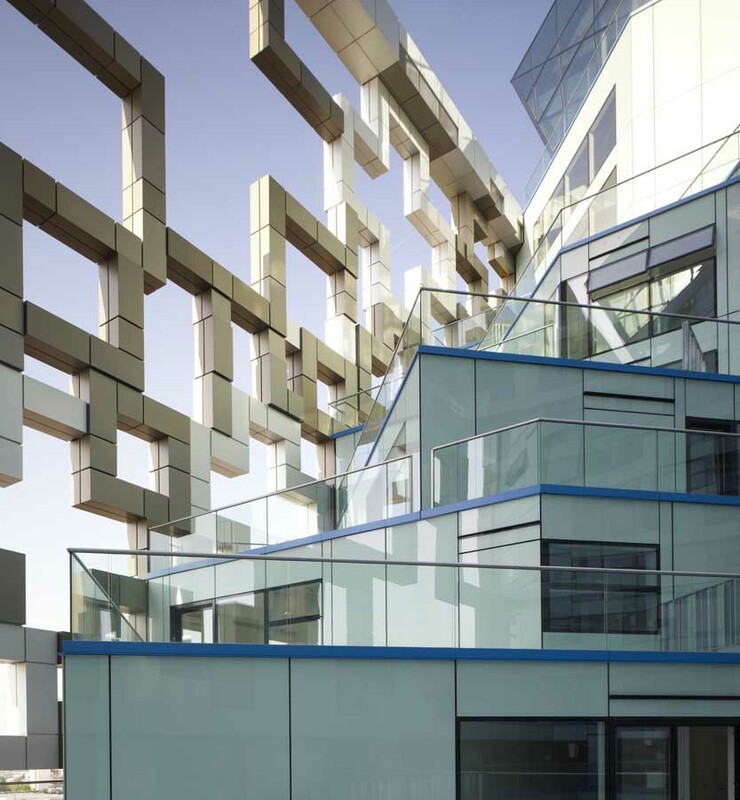 The building also features 2,500 sq ft of open balconies on the top floor, providing views across Centenary Square and back towards the Mailbox and Cube. A joint venture between Miller Developments and Bridgehouse Capital, Arena Central is framed by Broad Street, Holliday Street, Bridge Street and Suffolk Street Queensway and lies at the heart of Birmingham’s City Centre Enterprise Zone, benefitting from simplified planning and reduced business rates as well as forming a significant part of the city’s vision for regeneration, as laid out in the Big City Plan. 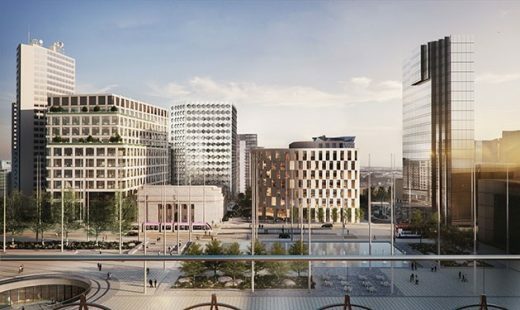 Alongside 1 Arena Central, the planning committee also approved the development’s infrastructure works and a modification to the site’s much anticipated public realm, which will form the first element of Arena Central’s phased delivery programme. Running from the north to the south side of the site, the public realm has been designed as an urban meadow in a style that mirrors other statement public spaces, such as the High Line in New York, and includes some 40 per cent soft landscaping. Arena Central is currently home to a number of redundant buildings including the former Carlton Television studios, and a leisure club, with a multi storey car park having already been demolished. Clearance work on the site is already underway with further demolition of the remaining buildings due to commence shortly and work on 1 Arena Central and the new public realm set to start in early 2015. Arena Central is a joint venture between Miller Developments and Bridgehouse Capital, comprising a circa £400m development with existing outline planning permission for up to 2.3 million sq ft of mixed-use development, comprising offices, hotel, residential, leisure and retail space, car parking and a public square forming the centrepiece of the development. Existing buildings on the site include Alpha Tower and the Crowne Plaza Hotel. The vision for Arena Central is to create a number of ‘oven-ready’ development plots, all of which will be set within an inspirational public realm with a uniquely landscaped pedestrian walkway – designed to echo the urban styles of New York’s High Line, the Promenade Plantee in Paris and London’s own Olympic Park – running through the heart of the scheme.